Is Diego Forlan Another World Cup Cursed Player? Arjen Robben is likely out for the year. The entire Bayern Munich team experienced their worst start in league history. In other words doing well in the World Cup can be deceiving. Although some of the greatest footballers ever made their name globally known by succeeding in the event, many of the best players in the World Cup this season have struggled to find their form following the world’s biggest sporting event. Did the restless summer factor into an exhausted 2010/2011 or are players like Diego Forlan just experiencing the same thing that every footballer experiences: a cold streak? Forlan has not scored a single goal in his last 12 appearances for Atletico Madrid and the Uruguay-born forward was rated by many football critics the single best player in this summer’s World Cup scoring five goals in an unexpected semi-finals run for the South American club. Now the chances are not going in, but soon they will. You need to continue trying and I’m determined to do that. You don’t forget how to score goals and I’m not thinking day in day out that I haven’t scored. The goals will soon arrive. You need to be calm and nothing else. In the game against Madrid I had two or three chances, and the other day against Almeria the same thing happened. I feel bad for having lost the derby, but on a personal level I feel fine. 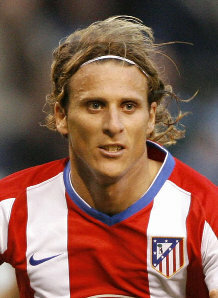 Forlan, who has expressed interest in a move to England this January, and his Atletico side currently sit in 8th place on the league table and only have around half of the total goals (13) that Real Madrid (27) has already accumulated this season. We will see if Forlan is just temporarily struggling or if he has been stricken by the curse of the great World Cup.